Following is a contemporary review of Dracula published in the Melbourne newspaper, The Argus on 6 November 1897. It's a fairly negative review, typically sceptical, that references Edmund Gosse's recently published article, "The abuse of the supernatural in fiction." "In Mr Edmund Gosse’s suggestive article upon the abuse of the supernatural in fiction published by us last week, he laid down one canon which, he truly enough declared, is violated by half the present day writers who trench upon the domain of the mystic and the abnormal. This law is that the products of their imagination, however extravagant and monstrous, must be so presented as to command our temporary intellectual credence. Although perfectly aware that the story cannot be true, we should be carried captive for the time being by the notion that it is. The rule will be generally accepted as one which ought to govern this province of literary art, but we can understand individual opinions differing widely as to the writers who do and do not observe it. Mr Gosse, for example, confesses that his common sense can be momentarily conquered by Mr H.G. Wells or Mr Frank Stockton, and gives the highest possible testimonial to Lord Lytton’s “Strange Story.” Yet Mr Wells’s half-human monsters and his wild idea of travelling back along the grooves of time by a mere piece of mechanism – a thing of wheels and rods and cylinders – will strike many people as the most audacious demands upon credulity made by any modern writer. If Bulwer Lytton, again, had singular power to thrill in the telling of a narrative, what is to be said of the utter impotence of some of his conclusions – the absurdity, for instance, which gives us as the climax to an elaborate process of incantation the materialisation of a human foot? In his strictures upon certain contemporary dealers in the supernatural, Mr Gosse is upon surer ground, and will command cordial assent. The method of some eminent novelists who have lately pressing into their service denizens of another world, and even the arch-fiend in human form, is matchless in its naivete. The pity is that Mr. Gosse’s article was penned before he had an opportunity of studying the latest essay in the abnormal launched upon the literary world. We have been reminded how easy it was in the ages of credulity to avoid over-stepping the boundaries of belief. But in Mr. Bram Stoker a writer has arisen who intrepidly assumes that medieval gullibility is in full survival. He appeals to his readers with the most horrid, yet in some respects the most ludicrous, romance of vampiredom to be found in literature. It is a bold attempt to concentrate the fables and superstitions which have existed in Eastern Europe especially for many centuries into a shape sufficiently like reality to cheat the imagination of the nineteenth century. Can the modern reader be induced to bestow a passing belief upon vampires any more than upon sylphs and salamanders? Where most men would answer no, Mr. Stoker says yes, and confidently tries the experiment. It may be argued that he does no more than imitate the hardihood of Sheridan Le Fanu, but that gifted author contented himself with au outline, and never ventured upon the elaboration of detail with which Mr. Stoker surrounds his vampire Count Dracula and the victims upon whom that monster preys in modern England. There is an extensive literature upon the subject of vampires, which this author must have studied with a minuteness and assiduity just sufficient to wreck his purpose. For If he had not painted into his gruesome portrait all the habits and characteristics supplied by a wealth of tradition, we could have believed in it better. Vampires – the "living dead," whose corpses cannot decay, but who have the power of rising from their graves at night to batten upon the blood of human beings - are the Vroucolakas of the Greeks. They have been treated of by an old German writer, Michael Raufft, in his learned book "De Masticatione Mortuorum in Tumulis," by the Frenchman Calmet, and by many another grave-faced sifter of medieval superstitions. All agree that these unpleasant nocturnal prowlers, who stalk abroad murdering and blood-sucking, are most common in certain countries, to wit, Silesia, Moravia, Hungary. Consequently to Hungary - or rather, well to the eastward of Transylvania - Mr. Stoker betakes himself in search of the home of his foul wanderer. He dwells, half man, half brute, in a gloomy castle in the deepest recesses of the Carpathians, surrounded by a bevy of lovely yet loathsome females, blood suckers like himself. 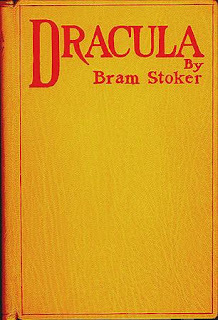 The mistake is that as Mr. Stoker designs to transport his monster to England, there to feast upon the teeming population of the metropolis, he is tempted to introduce Dracula in too strong a light. The more intimately we regard a vampire and take stock of his proceedings, the more disposed we are to forgot horror in scepticism. Ancient records of vampiredom avoided this, partly because they were deliciously vague. Raufft tells mainly of swinish munchings in the grave by certain evil-disposed and voracious corpses, which is n violation of social proprieties, but little more. Colmet, in his dissertation on the vampires of Hungary, contents himself with concluding that there are numbers of "revenans" whose bodies the earth rejects, but he refrains from committing himself to the theory that they may be actually caught either entering or leaving their graves. And ho takes the highly sensible view that a pretension of the Greek Church, to the effect that the earth would not retain corpses which had come under orthodox excommunication, may be accountable for the prevalence of vampiredom in Slavonic countries. But no difficulties daunt Mr. Bram Stoker. At close quarters we are shown the vampire endowed with nil the attributes which the amalgamated superstitious of the ignorant in all ages have woven about him. He is man insomuch that he must pass the daylight hours in his human form reclining upon a heap of foul-smelling earth, loads of which he convoys with him as personal luggage for this necessary purpose. He casts no shadow, gives back no reflection in any mirror; he can come and go through the merest crevice, can materialise out of moonlight mist, can change at sunrise or sunset to bat or wolf, can command certain of the lower brutes, cannot cross running water save at slack or ebb of tide, can transform into vampires all upon whose blood he feasts; and so forth. We are gravely invited by our romancist to contemplate a monster of this perplexing sort astir in busy London - to watch him being fought by energetic, intelligent men of the modern world with such weapons as garlic flowers, sacred water, and crucifixes. No more staggering demand upon what Mr Gosse terms “temporary credence” could well be made, for Mr Bram Stoker writes for a community mainly Protestant and for an age in which belief in the efficacy of relics and symbols has almost disappeared. It is true that the author does not lean over-confidently upon these agents. They can but alleviate the danger to be apprehended from the viciousness of a vampire out on business. The radical cure is effected as of old by knife and pointed stake. Mr Stoker, though he does presume immensely upon the capacity of modern readers to gape and swallow, concludes that their credulity will not stand a severer test than that of their medieval ancestors. An infallible corrective of vampiredom has always been to cause the suspected grave to be beaten with a hazel twig wielded by a virgin not less than twenty-five years old. Yet in practice the severed head and the stake driven through the heart were ever preferred. When the pinch comes, our latter-day author discards his theory of remedy by exorcism as gracelessly as his predecessors abandoned the hazel twig." Something about this review calls hauntingly to mind Poe's short story ''Literary Life of Thingum Bob, Esq'' Maybe it's the use of the first person plural and of the title Mr followed by the full name, then again maybe it's just me feeling somewhat unkind.